Rumor: France demanded that the U.S. remove buried American soldiers from their soil. Did you hear about France demanding the American soldiers buried over there be dug up and removed from their land? You know, the ones that died in World War II freeing that country? It was in all the news — they want our dead out of their country. Origins: Expressing disdain for the French (a popular pastime in America) ran at fever pitch during the first half of 2003. The manuvering in the United Nations by the French government to prevent the war in Iraq was viewed by many as an act of base ingratitude in light of the sacrifices made by Britain and America to rescue France and its people during two World Wars. That anger surfaced in a number of the rumors of the day, some of which called for boycotts of goods presumed to be made by French companies, and others which turned out to be mishearings or misunderstandings of events reported in the news. It is from this latter category that the “come and pick up your trash” blood boiler is plucked. Outrage over this craven act of anonymous vandals was swift and unanimous, with the French authorities just as incensed by it as anyone. This was not the first time the placement of America’s war dead had been the subject of rancor. In the 1960s, France, under Charles DeGaulle, bolted from the NATO Nuclear Planning Group and established their own nuclear deterrent, an act which strained French relations with the United States. In 1966, DeGaulle asked that all American soldiers be removed from France. “Does that include the dead Americans in military cemeteries as well?” U.S. Secretary of State Dean Rusk reportedly asked. 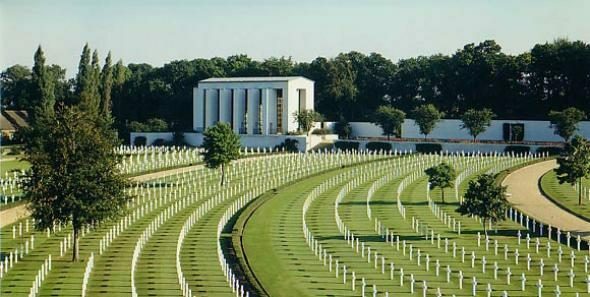 About 30,000 Americans who died fighting World War I are buried in eight European cemeteries (six in France, one in Belgium, and one in England), and another 73,000 U.S. servicemen who gave their lives during World War II lie at rest in twelve European cemeteries (five in France, two in Belgium, two in Italy, and one each in England, Luxembourg, and the Netherlands). These foreign burial grounds are administered and maintained by the American Battle Monuments Commission (ABMC) in Arlington, Virginia, but the ABMC does not pay “millions of dollars on rent for these cemeteries,” as another popular rumor boldly asserts. The United States has been granted tax-free and rent-free use of all these cemetery sites, in perpetuity, by their host governments. The honored dead rest in peace. St. Petersburg Times. 13 March 2003 (p. B1). The New York Times. 4 April 2003 (p. A6).